To be a bit cliché, this shoemaker is a professional Web Developer and her child is this blog, but it was past time to launch what I have of a new design. All the content is still here, everything else is a work in progress (kind of like most of my sewing projects)! In some ways, it feels like I blinked and it’s suddenly August. In others, I’m not sure how so much has managed to be crammed into the eight months since I last posted. Then again, very little of it has been sewing-related. 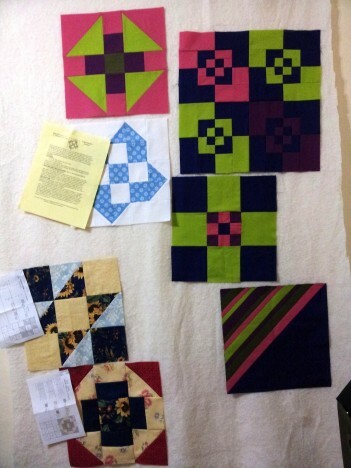 In fact, I spent most of the late winter and early spring without touching any sewing projects. Part of all of the happenings was a temporary move to Atlanta, GA through the end of 2018. 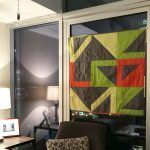 So, it seemed fitting that while exploring and learning about my momentary home, I stumbled upon the Welcome Blanket project. There are plenty of jokes that can be made about the vastly different cultures of Vermont and Georgia, but that’s all privilege talking. The challenges and cultural change for future new Americans are far more vast, and providing comfort with quilts is one of my all time favorite ways to give back to the community. I’d already been mentally playing with the idea of quilts and alphabets and something other than the techniques I’ve used in previous words-on-quilts projects. 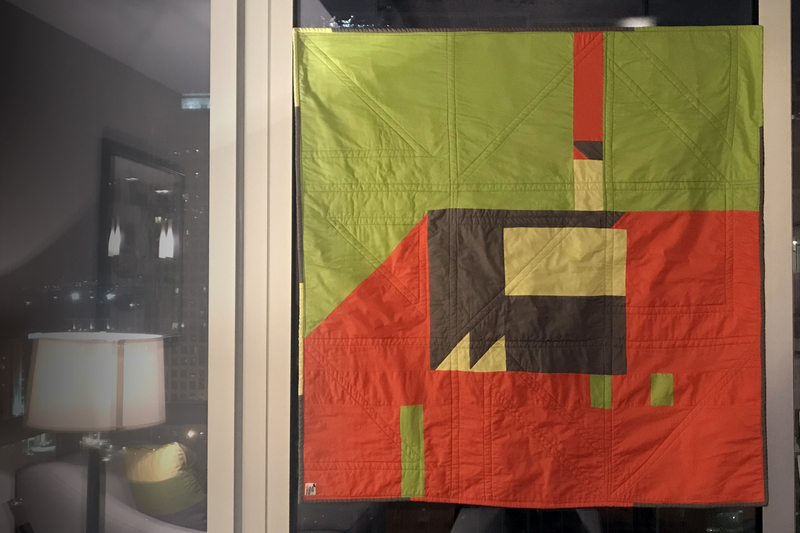 This quilt evolved from some sketching I did, inspired loosely by a very triangular alphabet graphic somewhere on the web (I can’t find the source). When translating it into fabric, my M/W unit didn’t come out quite as hoped—I should have shifted the diagonal piece to sit along the center bias line rather than spanning it. But, I love the graphic look that doesn’t immediately scream words at you. I pulled the fabric from my very minimal stash that traveled with me from VT. I was going for something modern and bright, although the darker gray background tones things down quite a bit. 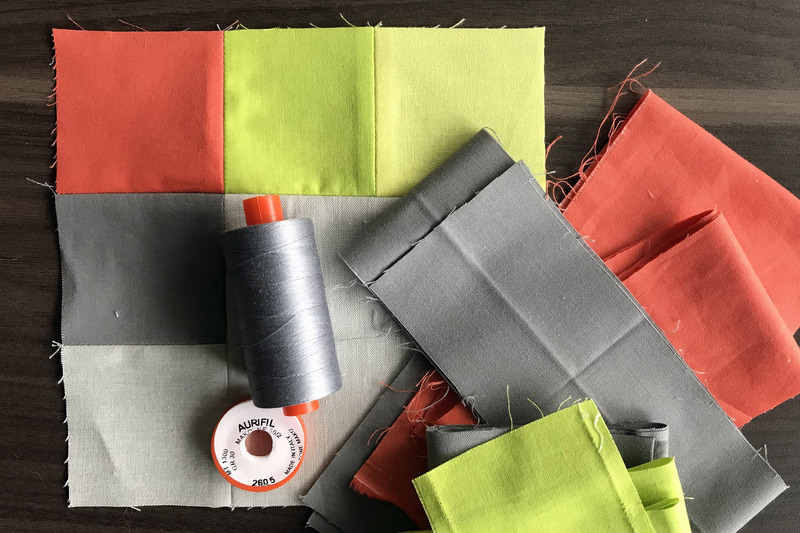 The fabrics are Kona Highlighter, Michael Miller Lime, Michael Miller Coral, and Paintbrush Studio Pewter. 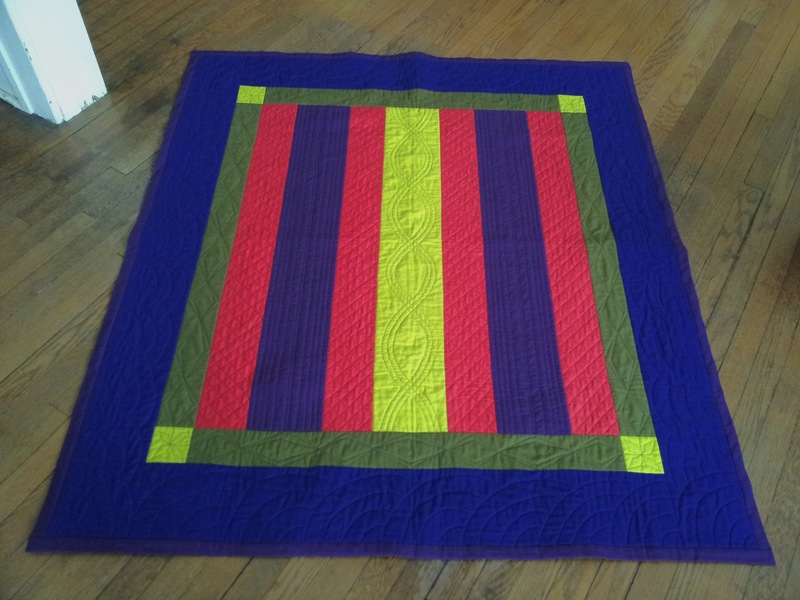 The blocks all finished at 14″, resulting in a quilt that shrunk down to almost exactly the requested 40″ square after washing. I pieced the back together with leftovers from the front, trying to use up as many of the scraps as I could. The rest went into the binding, leaving me with very little leftover from the 3.5 yards of fabric I started with. 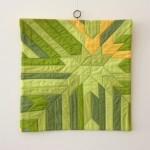 In between is Quilter’s Dream Green batting. I swung by a local store (Intown Quilters), and decided to pick up a package of the batting when I saw it there (I’ve heard a bit about it online). 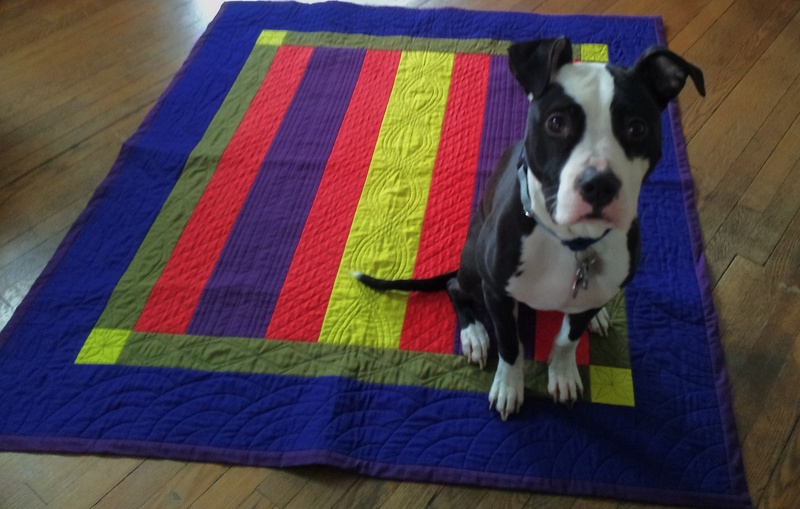 It’s made from recycled bottles, so is 100% polyester, but this seemed like a good size quilt to experiment with. Only after purchase did I remember that I should have bought cotton batting since I’d sized the quilt intentionally expecting around 5% shrinkage after washing. I needn’t have worried, as it shrunk as expected even with the poly batting. The quilting is pretty basic on this, just echoing the seam lines with a dark gray Aurifil 50wt. I have a new travel machine, a Pfaff Passport 2.0, and I’m still getting a feel for it. I like the integrated dual feed pretty well, although I’m not sure it’s quite as effective as my Viking’s walking foot. 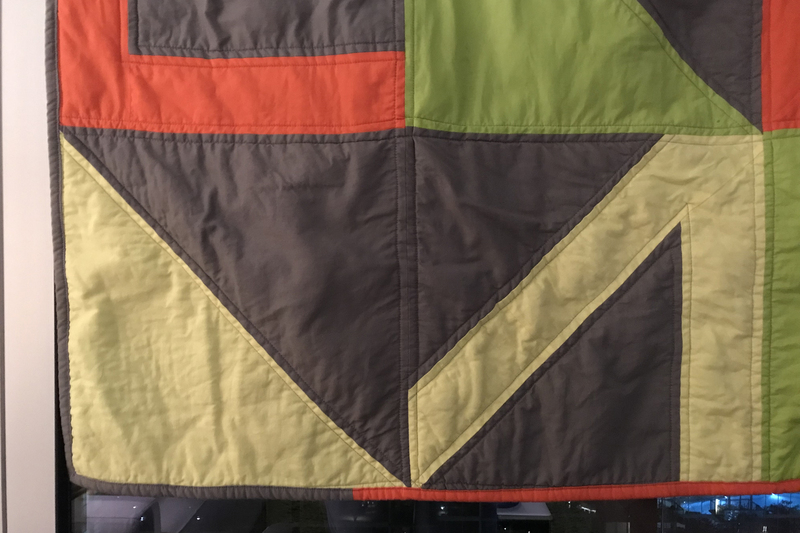 I ran into tension issues a couple of times while quilting this, and did end up with some minor puckering and shifting (mostly hidden after washing). Of course, I’m also dealing with a different setup for basting, as well as a batting I hadn’t used before, so it could be that I just didn’t baste as well as usual. I have plenty of other things to work on before the project deadline, so I doubt I’ll finish it for that, but I really hope to iterate on this design and try it in a two-color form that is closer to my sketch. I think there’s a lot more to play with when it comes to these shapes and how color interacts. 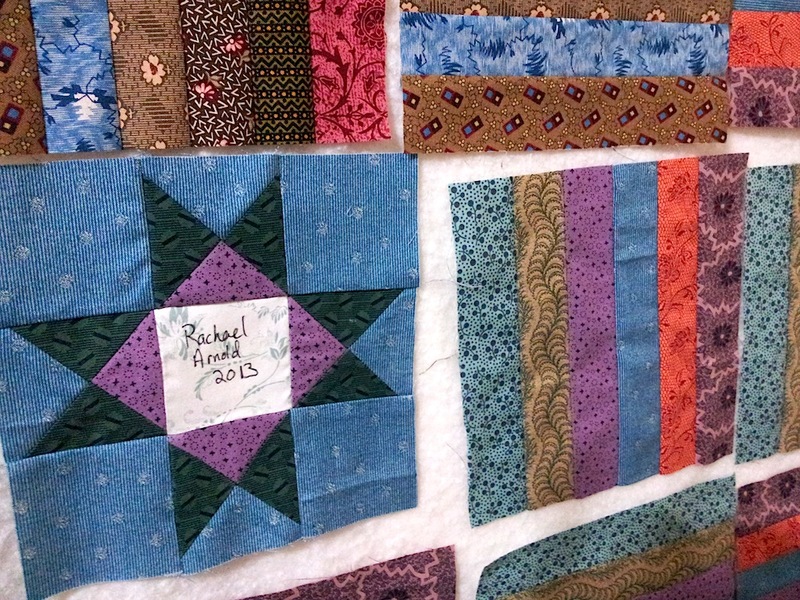 I’ve found that a common thread in my quilting journey is how it connects me with a community wherever I travel. I attended a meeting of the Atlanta Modern Quilt Guild, which turned into lunch and an outing at MODA (Museum of Design Atlanta), the collection point for Welcome Blankets. The guild had quite a few to donate. 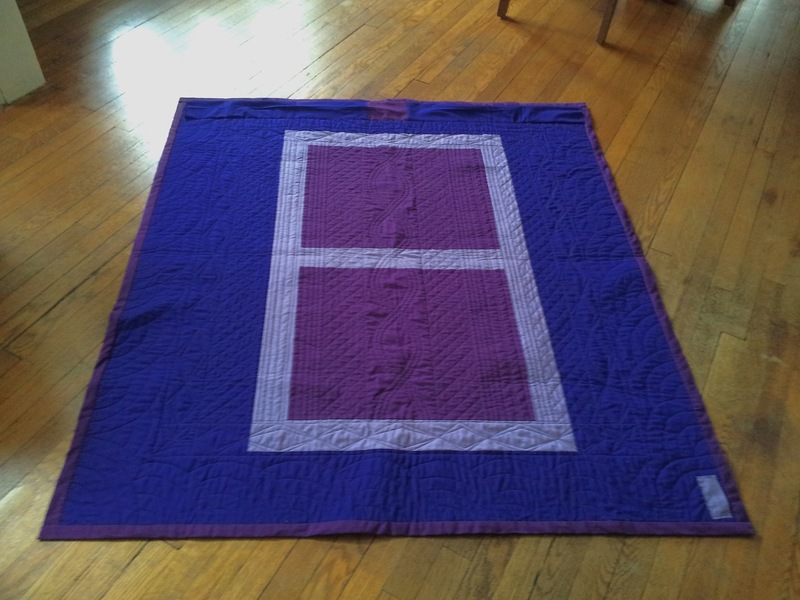 So, it all comes full circle that a quilt made to welcome someone to the US also allowed me welcome into a community of quilters here in my temporary home. 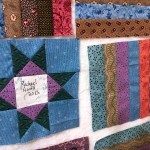 Quilting: it’s not just about the fabric and making. If you want to create your own Welcome Blanket (quilt, crochet, knit, etc), the deadline for submissions that will be included in the MODA display is August 25, 2018. They may continue taking submissions after that; check out the project website for more information. Spring has been a whirlwind so far. 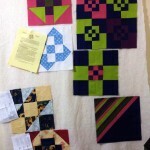 I am terribly behind on blogging about my finished projects. I have three completed quilts (two that are waiting to be delivered, the other finished this weekend at my guild’s spring retreat). This has been finished for a couple of months! It started with a challenge of colors. 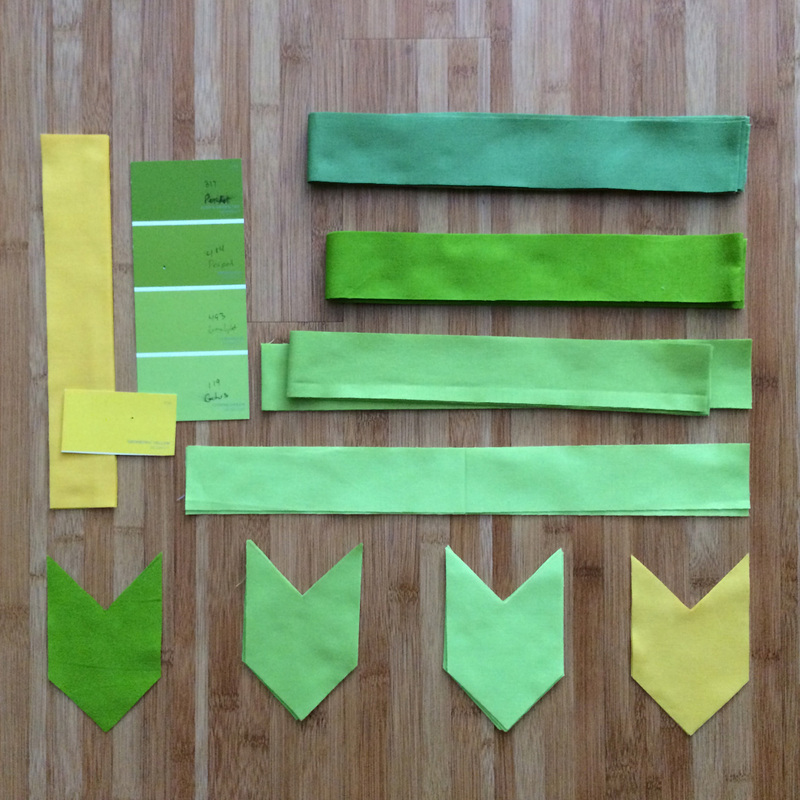 Five of them, four greens, one yellow. Of course, none are fashionable; the greens are all slightly different from the famed 2017 Pantone Color of the Year, the yellow a bit too off-trend. Then there’s a challenge of size. 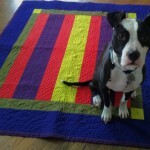 18″ square. Constraints like this are helpful to me when it comes to challenges. “All the Whys”, Rachael Arnold, April 2017, 18”x18”. The lacking part was inspiration, until I scrolled through Instagram and came upon this lovely bit of mixed-media art by @aykceramics and @aleksandrazee. Which, of course, introduced another challenge as said design doesn’t translate well into squares and blocks. But through y-seams and trial and error, it came together. “All the Whys” (in progress), Rachael Arnold, April 2017, 18”x18”. My partner said it looked like an abstract NY State at this point. The fabrics weren’t perfect. If I were making this again, I’d make sure the two lighter greens had slightly more contrast, and the darkest be a little more vibrant. I finally dug out my package of Quilter’s Dream Orient batting (a blend of cotton, bamboo, silk, and tencel) that I’ve had for years, thinking this was the right project to use it for. I quilted it with a perfectly matching Coats & Clark variegated green 30wt that came in a goody bag at some point (kismet). I like how the thread weight helps highlight the design lines, even as it blends in and out. I finished it with facing instead of binding, incorporating a hanging sleeve into the finish. 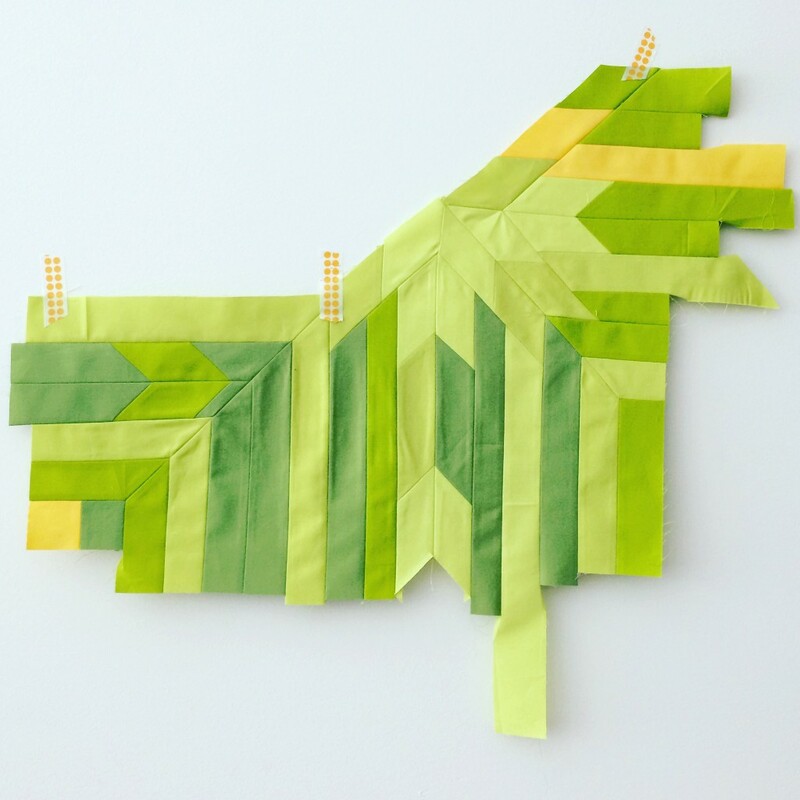 My corners aren’t perfect, but the green and yellow make me dream of daffodils popping up in this very slow-to-start spring we’re having in Vermont. This and those of my guild mates will be on display at VQF in June. It’s a very eclectic mix of minis. Aside from the baby quilt I finished earlier this week, I’ve spent most of my sewing time lately on the various samplers and block swaps I’m currently involved in. My sewing space is a mess, but my design wall is rather colorful at the moment. The final swap for this round of my bi-monthly LQS block swap is a 6″ Ohio Star signature block for each member (10) and however many sets of three 6″ piano key blocks we want to use for our final layout. I’ve finished four of the signature blocks and 20 piano key blocks (out of 44 that I plan to make at this point). My other stars will use different fabrics from the four completed ones (seen in the blue/purple/green/orange piano key set), while the other piano keys will be made mostly of the same fabrics used in the previous swap blocks. Rounding out the wall this week is another block for the Modern LQS sampler, and another for the SYWTQ Amish-esque block. Because we traveled over Easter weekend, I didn’t make it to the other sampler meeting, so I should have two to finish next month. 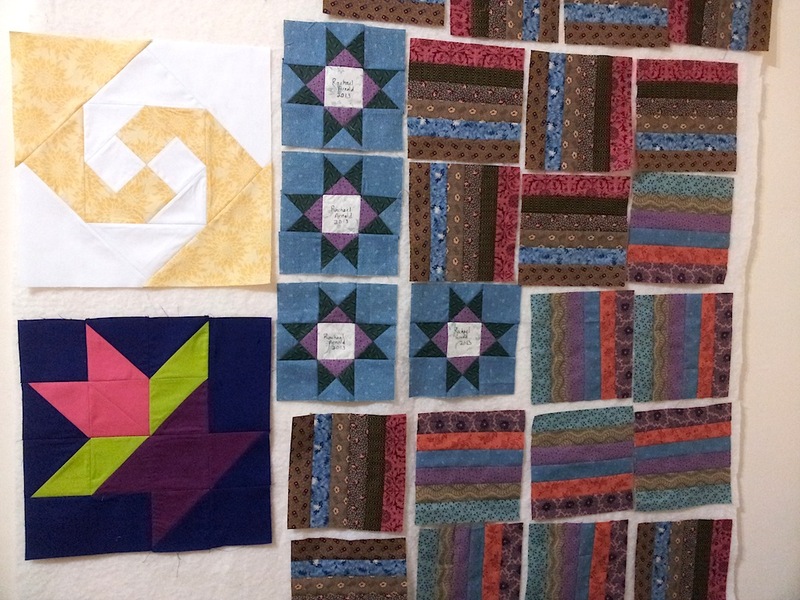 I’m currently working on three different sampler quilts (not to mention last year’s, which I still need to piece), and I oddly have the blocks up on the design wall for some reason (I’m usually good about putting them into their proper locations), so I took a (bad) photo. One is with the Sew You Want to Quilt group, focusing on Amish blocks (I use the term loosely, based on research) in our own choice of colors. I have a few of those done, although I am still behind on one block from early February. The other two are monthly Saturday Samplers (well, one is on Thursday nights) at the two closest LQSs. For those unfamiliar with the Saturday Sampler concept: you pay a registration fee ($10-15 seems standard) which covers a kit of the fabric for your first block at the first meeting. From there, if you continue to bring your completed block from the previous month to the next meeting, you continue to get the kit for the current month free of charge. If you can’t make it to the meeting, you typically have to purchase the missed month’s kit. Some shops give you a discount on the first kit you miss, some give you one free pass, some give you an incentive to finish the top before the next cycle starts, etc. Some give you all the individual pieces cut out, some give you strips and squares to cut and chain piece, some just give you chunks of fabric to cut everything out yourself. My two shops each have their own quirks, and sometimes the rules and procedures even change year to year. Even though I’m not absolutely in love with the fabric choices and styles of either, I do greatly enjoy the social aspect—an hour each month to meet up with other local quilters, learn what the shops have to offer in the coming month, and see the creativity of everyone in what they bring to show and share. I’m going to have to get creative with layouts for 12″ blocks though, that’s for sure! After I posted this top back in January, I went a bit incommunicado about it, as I decided to submit it to the Great Lakes Seaway Trail “Beauty of the Byways” show this year. I finished it with nary a minute to spare, so I don’t have many photos of the details, nor of it hanging, but here’s an overview. While some say you should travel a byway to see the “simple life”, my journeys on byways around the country have been for the opposite reason; sometimes I need a break from the repetitive, “simple” driving of the Interstate System and long to see the complexities of agriculture, forests, seaways, rivers, and hundreds of small towns. Driving on Ohio’s Amish Country Byway may find me slowed by a horse and buggy, but the leisurely pace gives me time to admire the rows of corn in fields or meadows of flowers along the road. 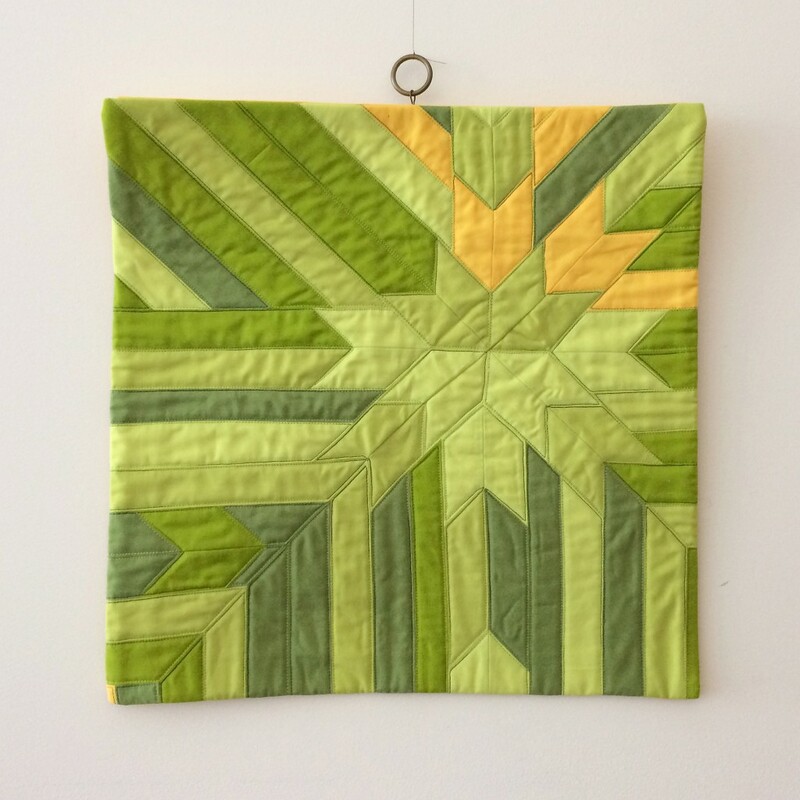 The piecing of my quilt is not intricate, but to call it simple belies the involved process of creation—from choosing the colors of fabric and thread, to the complexity of each stitch holding the three layers of cotton together. It is plain, but sometimes the monotony of life’s daily bustle calls for slowing down and enjoying the “simple” complexity that you can find when you turn off the more often-travelled path—whether it be a break from quilting projects of many pieces to work on something inspired by the Amish or taking time to drive along a byway and admire the sights. The pattern is mine, but it is strongly influenced by quilts made by Amish women in Pennsylvania and across the Midwest in the late 19th Century, now in museum collections. 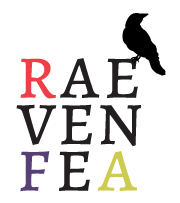 The title comes from the color scheme, one I found for yarn somewhere on Pinterest. They called the scheme “Shakespeare”, so I ran with that. It’s “an English interpretation” because English is what the Amish call non-Amish. The colors are Kona Coral, Kona Regal, Kona Hibiscus, Kona Moss, and Free Spirit Citrine. The back is another Amish-inspired composition using the purples from the front (Regal, Hibiscus) and Moda Bella Thistle. It’s a little off-center, but not crooked, so I call it a basting win. Considering that I cut 7 of the 12 pieces incorrectly when putting it together, I should also call it a miracle. I hastily applied a handwritten label to one side, but once I get it back, I’ll put a better one on. It’s quilted in a charcoal thread that I had leftover from the Cyclist quilt; many sources on Amish quilts say that their quilting was done in black at that time, so I chose to use a dark thread rather than matching to the colors of the quilt. Pellon Nature’s Touch in the middle gives it a nice drape and warmth factor. I didn’t wash it before the show, but can’t wait to do so once I have it back in my hands. The binding is wide and non-mitered—another nod to the Amish tradition. I chose Hibiscus, as I wanted to put it next to the Regal as a way of giving the inner pieces more contrast. In certain light, the Hibiscus and Regal photograph very similarly to each other when they are in different areas of the quilt. It’s also Moof approved, but I’m starting to think he’s just a sucker for soft quilts on wood floors. I don’t think this is the last of my experiments with color schemes and Amish Bar quilts!